If consumed regularly, red grapefruit prevents not only cardiovascular but also serious malignant diseases. Many botanists believe that grapefruit is actually a natural blend of orange and pomelo, a citrus fruit that was brought from Indonesia to Barbados in the 17th century. It was named in 1814 in Jamaica because of the way in which it was grown. Red Grapefruit is an excellent source of vitamin C, a nutrient that strengthens the immune system and helps the body to defend against infection. This powerful antioxidant reduces the damage caused by free radicals, which leads to inflammatory processes. Grapefruit is therefore recommended to patients with rheumatoid arthritis, osteoarthritis and asthma. Intense pink-red colour of grapefruit comes from lycopene, a phytonutrient that has extraordinary anti-cancer effect. It is one of the best fighters against free radicals - compounds that can damage cells. Recent research has shown that regular intake of foods rich in lycopene, such as red grapefruit and tomatoes, significantly reduces the risk of prostate cancer. The development of tumours is also prevented by limonoids phytonutrients, which are also found in grapefruit, by encouraging the formation of detoxifying glutathione transferase enzymes. This enzyme helps the liver to eliminate accumulated toxins from the body. In recent studies on animals and laboratory tests on human cells, have shown that limonoids protect against skin cancer, oral cavity, breast, stomach and colon cancer. The researchers found that the human body can absorb and exploit the long-acting limonoids called limons, which in citrus fruits is contained equally as much as vitamin C. In citruses, Limons are present in the form of limonin - glycoside, e.g. it is bound to a molecule of glucose (sugar). Our bodies easily absorb this compound, dissolving the sugar and releasing limonin. Moreover, scientists have found that red grapefruit pulp contains in its pulp glucarates, compounds that protect against breast cancer. Why is grapefruit good as a medicine? There are many health benefits of citrus fruits’ bitter taste, we will mention some of them. Red grapefruit contains pectin, a form of soluble fibre, which as shown by the results of the research conducted on animals, slows the development of atherosclerosis. The animals that were on the diet rich in cholesterol and pectin from the grapefruit, showed that their arteries narrowed by 24 percent, while those whose food was abundant in cholesterol without pectin, their arteries close by even 45 percent. Studies published in professional journals, showed that pink and yellow grapefruit can lower LDL (bad) cholesterol levels, while red grapefruit lowers the levels of triglycerides. If you want to reduce the risk of kidney stones, eat red grapefruit or drink juice. The latest British study showed that women who daily dunk half to one litre of grapefruit juice, apple or orange, increased their urine pH. In addition, this juice helped the secretion of citric acid, which has considerably reduced the risk of kidney stone formation. Experts claim that the regular consumption of grapefruit juice significantly reduce the chances of lung cancer and colon cancer. Three glasses of this juice a day reduces the activity of enzymes that activate cancer-causing chemicals found in tobacco. In the cases in which rats were injected in the colon with carcinogens, red grapefruit and its isolated active compounds (hesperidin, apigenin, limonin, naringenin, naringin, nobiletin), apoptosis (self-destruction) of cancer cells was noticed, and the production of healthy colon cells has increased. The latest published laboratory studies of American scientists have shown that naringenin, a flavonoid contained in red grapefruit, helps to correct the damaged DNA of cancer cells of the human prostate (LNCaP cell line). The risk of cancer increases with age, because as we get older, the more times our cells divide, so the greater the chances of mutation. Recovery of DNA is one of the primary defence mechanisms of the body against cancer, because in this way mutations that can cause cancer are stopped. Naringenin rehabilitates damage by encouraging two enzymes that recover the DNA in the replication phase. Also enzymes, 8-oksoguanin-DNA glycosylate and (hOGGl), and DNA polymerase beta, are involved in the recovery. Unlike many other malignancies, prostate cancer is initially slowly developed and often remains undiagnosed for a long time. Therefore, regular consumption of grapefruit, especially the red one is the best way to prevent this disease, because it encourages the repair of damaged DNA cells of the prostate. If you are taking a certain medications, consult your doctor about whether you should drink grapefruit juice as it can certainly interfere with their action. Compounds that red grapefruit contains, including naringenin, slows down the normal detoxification and metabolic processes in the intestines and liver, which reduces the body's ability to dissolve and excrete certain drugs. Such medications include immunosuppressive cyclosporine and calcium channel blockers, such as felodipine, nifedipine and verapamil. Other drugs whose effect is enhanced by the grapefruit juice are the antihistamine terfenadine, hormone estradiol and antiviral agent saquinavir. It contains a compound naringenin, which activates the enzyme (cytochrome P450 3A4) in the small intestine responsible for the metabolism of statins. Inhibits P-glycoprotein molecules that is created in the intestinal wall and in normal circumstances the statin is transported back to the intestines. As warm days are coming closer, more and more people get frustrated with their weight. This scenario is more or less well known. Fortunately, red grapefruit for weight loss, which should be taken in the form of juice, can solve this problem. Here is how to make this wonderful drink. Cut in half chilled grapefruit and carefully spoon remove the pulp from the middle. 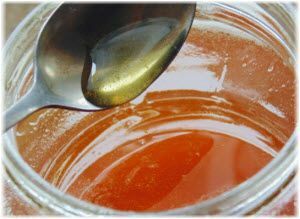 Mix with honey in a blender until you get a uniform mixture. That is it! Drink a few sips of this remarkable elixir after lunch (at least 20 minutes) and it will burn more than half of the calories you consume during the main meal. Red grapefruit and honey are an excellent combination and are recommended for all those who want to lose excess weight, lower cholesterol by 15%, and triglyceride levels by as much as 27%. You are probably wondering, how is it possible? Believe that it is, because red grapefruit contains calories in small quantities, only 42.1 calories per 100 grams of fruit. In addition, it is rich in dietary fibre, pectin, lycopene, limunoids and numerous other compounds. How do you make a salad with grapefruit? Wash beets and bake it in a covered glass Pyrex bowl in the oven at 180 ° C for about 90 minutes or until completely tender. Then leave it to cool, then peel and cut into thin slices. Peel grapefruit and cut it into pieces, and mix with beets and alfalfa sprouts. Mix all ingredients for the dressing and pour over beets and grapefruit. Gently stir and serve. Garnish with fresh basil or thyme. Red grapefruit and olive oil are an exceptional combination, and in many foods are used together. How do you make this tasty salad? Peel red grapefruit and cut it into pieces, and put it into a bowl. Add onion, olives, chives and basil. Spice with vinegar and olive oil. Add salt and pepper, and stir slowly. Leave for half an hour to stand in the refrigerator before serving.